“Hafa adai,” Ivan said as we stepped off the Continental Airlines plane that took us from stormy Manila to sunny Guam. 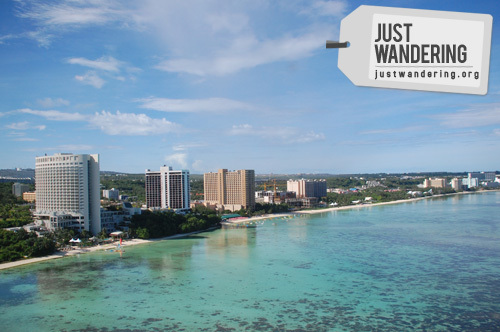 “No, I meant hafa adai,” Ivan said while pointing to the sign welcoming visitors to Guam. The locals greeted us with hafa adai every where we go, whether it’s day or night, whether we’re just seeing each other or parting to go our separate ways. From the first night meeting the Guam Visitors Bureau team along with the other contingents from Japan, Taiwan, Hong Kong, China, South Korea and the USA at the Chamorro Village Night Market up to the fiesta in Santa Rita, we were warmly welcomed like long lost family members. It’s hard to ignore how similar Guam is to the Philippines. Both have the same tropical climate, terrain and underwater treasures. Like the Philippines, Guam was also colonized by Spain. The huge Filipino population in the tiny island meant that there are plenty of Pinoy fare (or very similar to it) on the buffet table. But as the Southeast Asian cliché go, it’s same same, but different. Since Guam is a US Territory, the infrastructure is similar to that in mainland USA. The laws are also the same, though there are also local laws. The US dollar is also the local currency. We came here for the Maila Ta Fan Boka food festival. The Chamorro phrase means “come, let’s eat” in English, and eat we did. We tasted every possible meat that you can barbecue or make into kelaguen (including Spam). Kelaguen is like the Pinoy kilawin, though made with lemon or lemon lime, depending on the recipe. I’m no fan of kilawin, but I’m a really big fan of kelaguen, specially when made with fish or shrimp. In between all that eating, we shopped. We did some sight seeing too, but it was the shops that really excited us. With duty-free shops, outlet stores and 24-hour K-mart, how can you not be excited? We’re flying back to Manila tonight and we’re trying to squeeze in some more shopping, swimming, sun bathing and in my case, Internet time before checking out. I’m excited to go home, but I’m also intrigued to explore more of Guam when I don’t have a schedule to stick to. ay hala! toinks! sorry, asa Guam ka pa din pala knna, kala ko nakabalik ka na kase my mga photos na akong nakita naka-tag sau. hehe at super tlga kinukulit kita sa mga tanong ko. THanks for answering Nina. sorry sa abala. Cha cha cha Chamorro! Cha cha cha Chamorro! ? ? ? Ay, nawala yung notes! Haha! Hafa adai, hafa adai, hafa adai! “But as the Southeast Asian cliché go, it’s same same, but different.” Quoting for future reference! I have a grandmother who lived in Guam for a long time. She cooks this Chamorro dish called Kelaguen. Delicious and refreshing! I lived on Guam for 30 years and saw many changes such as street signs are now on display. When they first appeared some readily disappeared as the locals displayed them in front of their homes. Telephones were hard to get so communication was hit or miss. Only a few restaurants and 2 or 3 hotels. With the increase of the tourist industry many things improved and almost anything can be purchased. Not as much as I would like, pero meron! wow! swerte mo naman. blogger din ba si Bb. Pilipinas Lian Ramos? My gosh! What an awesome view of the bay. Gloriously turquoise! Hello Miss Nina, if you have time could please give me some tips on Visa application for Guam? I have used Visas from Japan and South Korea.